The nuclear age brought more than incredible energy, it spawned an era of mad scientists with wicked ambitions. You, being the maddest of scientists, have developed a method for animating and controlling slime to create an army unlike any before. 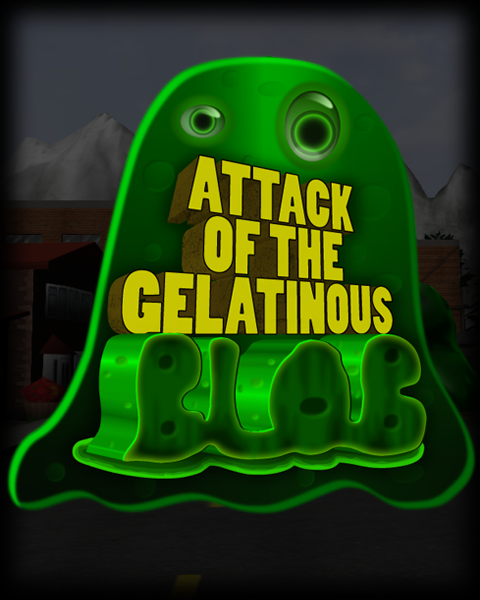 Attack of the Gelatinous Blob is a Real Time Strategy (RTS) game placing the player in the role of the Mad Scientist. Progress through levels, destroying cities while fighting off the army. Build support structures to defend your base and enhance your blobs; blobs that have the unique ability to morph their composition and skills depending on what they absorb throughout the map. With your horde of blobs and arsenal of doomsday weapons, you will conquer the defiant humans! Ranged blobs can now hold their target in place with their sticky goober attack. It has a chance to stick to the human preventing them from attacking. It's great when you are being swarmed by a mob of angry civilians whose homes you have destroyed. Along with this ability, the civilians are now more curious towards the blobs. They will walk up to them, poke them and try to interact. It rarely turns out well, blobs are hungry and curious also. If the civilians see something that scares them they will now run away or go and hide behind something sturdy, such as a car. Their other actions have also been balanced and have a bunch of more animations to react to specific situations. You can see the changes in this handy video, so take a look! Be sure to follow us on Twitter @AotGB for updates! Dev Update #7: Old-time movie effect. AI fixes and a cool old-timey black and white movie effect! We've made a video talking about some recent changes to how the AI interprets the map data to decide where to place turrets and defences. 1.Will you have a campaign if so how long do you think it will be? 2.WIll there be a skirmish mode? 3.Are there any other factions that your planning tio add other than the blobs? 4.Wioll you have interesting types of uinits? 4.Lter down the line are you going to improbve the interface sicne it looks kindy dull? 5.Will you habve a challenge mode(like starcraft 2 if you'v played it that is)? 1) yes there will be a campaign, about 12-20 missions long. Plus some planned expansion levels if time permits. 2) Skirmish mode is on the drawing board, although not guaranteed to make it in. At least not yet. 3) Blobs only. You play the bad guy here, invading the towns and cities. 4) Yep, quite a few. The blobs are fairly customizable and change their abilities based on what they eat and absorb. So you can experiment and combine different items to get different effects. 5) yea that's planned. A lot of the HUD is just placeholder icons now, and they are sometimes hard to read, so that has to change. 6) dunno, probably not for the release. However the game will be fully moddable, so that would be an easy feature for a keen modder to add in. Thanks! I want to keep the development fairly transparent to hopefully help others and occasionally solicit feedback on features. Thanks! We plan to post much more too on a regular basis. It looks awesome so far. I see great potential for this game. Cheers. The game's true colors should really start to shine once the AI demos start coming in. Can't wait. Any hints as to what enemies we could be seeing? The most common type of enemy will be humans. What'll make them interesting is their behavior, as the game will mimic realistic crowd behavior. Civilians will perform actions like rallying together, fighting back, fleeing and going off the whack hysterical based on various conditions and parameters. We've been pretty quiet for a while. But don't worry we're still blobbing it up here and we're gonna get noisy REAL SOON! #skyrim has so much content in it, quests, dungeons, characters. I can't quite fathom how much work went into the game. It's really impressive how much content is in #skyrim, there's no way I can finish every quest, cave.